A mother and wife's blog about moving to Beijing, China from the United States and living abroad. Here in Beijing we have four big Walmart type stores, Carrefour (French brand), Auchan (French brand), a Sam's Club like store called The Metro (German brand) and Walmart, oh and then the Chinese created their own, Wumart. Now before you get all excited and think that I have three very nice stores to choose from, understand that these stores are the Chinese version which means live things swimming in the meat section, dirty, slippery floors, and all things Chinese. So basically they took the Chinese Walmart and made their own version. If possible, it is even stinkier than the Carrefour and Auchan. I'm not sure what makes them so stinky, but I know selling this fruit doesn't help. 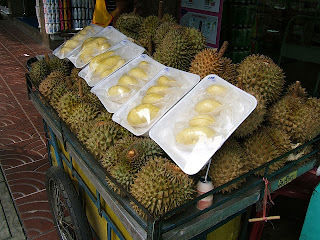 This is called Durian, and I liken the smell of it to rotting sewers. I bought some, trying to be adventurous one day and by the time I got it home, I took it straight outside to the trash and threw it away. OMG does that fruit smell. The guy I used the picture from on Flickr says that it is banned in hotel and restaurants all of Asia because of its smell. I believe that! The fact that someone had courage enough to eat it, after finding it somewhere and smelling it is beyond me!! So you must tell me, what is shabu-shabu??? United States born mother and wife, living the expat life, living and learning in Beijing, China. My Beijing Expat Life © 2012. Simple theme. Powered by Blogger.